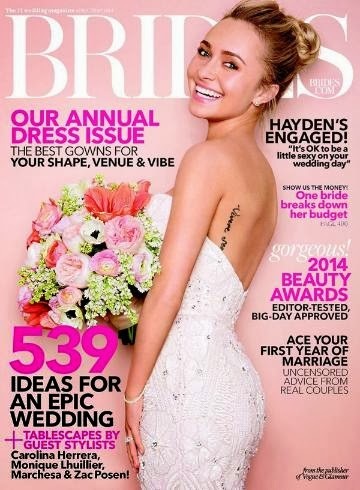 This month Hayden Panettiere graces the cover of Brides Magazine. What's most noteable is that in a vastly conservative industry that aims at appealing to the masses, they allowed for a subtle peek of her body art, which, to my knowledge at least, hasn't happened in the mainstream bridal industry before. I've discussed my body art previously, but in all of my pieces, I've always been very cognizant of their placement in relation to a wedding dress. However, after seeing this cover, I actually think that my 30 year old self wouldn't mind it so much if a had a little bit of ink showing when I got married. And I also love that Brides is addressing (albeit in small steps) the evolving look of the modern bride. What do you think - ink on your wedding day, a do or a don't? wow i'm pretty surprised they're showing her tattoo here. but seriously tattoos are so common now that i'm sure lots of brides have them showing on their big day, so why not? I just have one tiny low back (aka tramp stamp haha) tattoo so no worries about showing it. but if I had something more visible I would just try to make sure it still looked tasteful. I do not have any tattoos (seriously afraid of needles here, like so afraid I avoid doctors). But if I did have a tattoo I do not think it would be something I would necessarily try to hide on my wedding day.